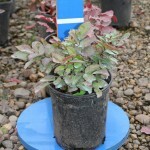 A low, spreading shrub with spiny, leathery, compound, blue-green leaves that turn burgundy in winter. Yellow blooms in spring are followed by blue-black berries. It spreads by rhizomes or above ground. 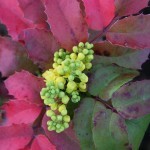 Tolerant of some shade and drier soils once established.